This is a post for students who are planning on studying in Spain. I’m going to lay out a few tips and tricks you can use to blend in a bit better with the locals and get a really “Spanish” experience out of your time abroad. These aren’t hard and fast rules, but they are good guidelines to follow. I’ve studied in Spain twice, and these are things that I wish I had known when I went. 1. Ditch the Americans- It will be very tempting to stick together with other Americans in your program and go see the sights, try the food, and pick out a good bar to frequent. My advice is to avoid this as much as possible. Find ways to meet locals. At first they will be surprised that you took an interest, but before long they’ll be inviting you to soccer games and parks where they hang out with their friends. 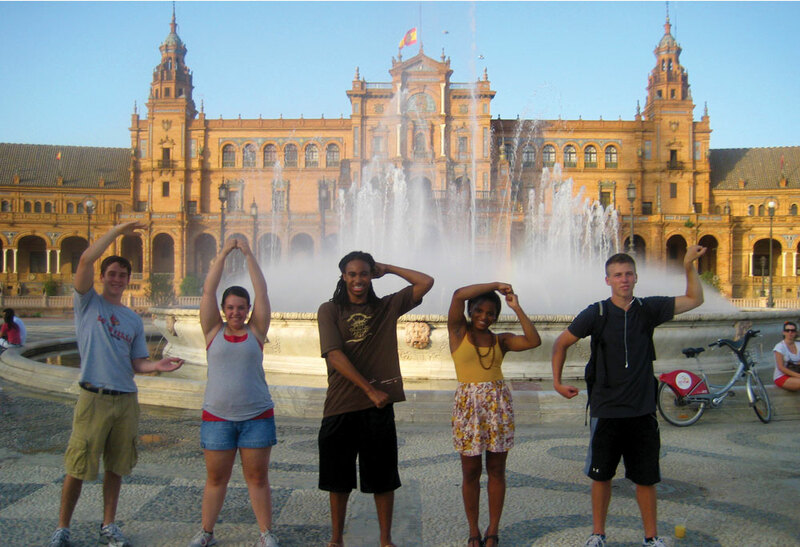 Your Spanish will get better, and you will get a real look at what life is like for a Spanish university student. 2. Learn the public transit- Taxis are expensive, and walking everywhere takes time and is tiring. In Seville, there is a public bicycle system that I highly recommend. Granada has great buses, and the Madrid metro is the best I’ve ever seen. You will get lost a few times, but after that you will be glad you took the time to figure it out. There’s no substitute for seeing the city on your terms. 3. Forget your fancy phone- For about 50 euros you can get a good old-fashioned brick phone and plenty of pre-paid minutes. Smart phones are still very much a luxury in Spain, and while it can be tempting to drop a Spanish SIM card in yours and stay connected, it isn’t safe. Most of your friends will be sporting older models too, so you won’t be missing out and you will definitely save some money. 4. Eat the food- I don’t like all of the Spanish food I’ve ever tried. I did, however, try everything that my host mom gave me. Not only is it polite, it’s one of the reasons you’re there. I’ve had four host families, and the number one complaint I’ve heard from them about other Americans is that they are picky eaters. Unless you have a dietary restriction, you should try everything you can. 5. Stay sober- This is the second biggest complaint I’ve heard about Americans from my Spanish friends. Being drunk is a good way to keep Spanish people from talking to you, because Spanish people don’t drink in excess. Drinking too much can be dangerous and it would be embarrassing to show up to your host home obviously drunk. 6. Ask for help- This is the tip that I wish I had followed more. Are you lost? Tell someone. Forgot the word for fork? Point at it and look confused. Not feeling well? Have someone take you to the pharmacy. People can feel isolated when they are abroad, and the biggest reason for this is because they want to do it all themselves. You will make better relationships with people and struggle less if you just break down and ask. 7. Give someone else your passwords- To everything. And make them change them. Don’t let them tell you what they are. Get rid of Netflix, social media, even an email account you don’t really need. Disconnect. Looking back and seeing that you spent three hours a day in bed watching bootleg episodes of The Walking Dead won’t be nearly as rewarding as looking back and knowing that you made the most of every day. 8. Study- I know that’s probably not what you’re looking forward to the most. It wasn’t my favorite thing to do either. But you have to have get credit for your classes, and you just might learn something in the process. 9. Speak the language- Silent dinners aren’t fun for anyone. Not you and not your host family. They know that you aren’t as good at Spanish as they are. They won’t be offended by it, even when you accidentally say something offensive (and you will). My program director said it best when he told us that “those of you who practice will improve, and those of you who practice less will improve less.” Making mistakes is encouraged. 10. Enjoy yourself- It is easy to get over there and after the first few weeks… “hit a wall.” It isn’t fun and new anymore, and you’re starting to get homesick and tired of all of the differences. The best thing to do when this happens is to make yourself get out there and try something new. Make a new friend or find a new hobby. The time will fly by, and you need to make the most of it. Let me know if you have any questions, and enjoy your time in Spain. It’s a great country. This entry was posted in Uncategorized and tagged Spain by crmall01. Bookmark the permalink.